Chairs2Share is a program designed to enhance the way people enjoy the city's green spaces. Chairs2Share makes deck chairs available for free to allow visitors, residents and workers to appreciate Brisbane's enviable outdoor lifestyle. 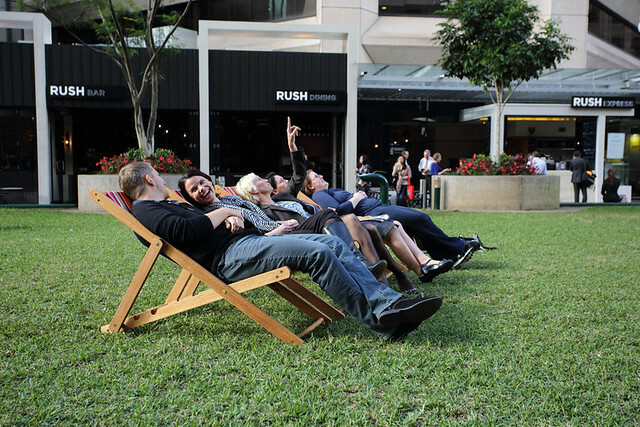 Introduced in June 2013, deck chairs are available in Roma Street Parkland and City Botanic Gardens. People using the chairs can also take advantage of Council's free Wi-Fi in City Botanic Gardens. Chairs2Share provides attractive and inviting recreational areas in the city and is another way Council is contributing to a vibrant, active and healthy city. The program contributes to Brisbane's reputation as a New World City, joining the ranks of other great cities with similar seating options, such as New York's Bryant Park and Times Square. View the Chairs2Share locations on a map. Select the blue icon to find more information about the location. View Chairs2Share locations in a larger map. Chairs2Share deck chairs may not be available in poor weather or while projects are undertaken. View the Chairs2Share photo gallery as a slideshow, or view photos individually in Council's Flickr account.